Interview with EMILY CHRISTENSEN, PH.D. Article first published as Interview: Emily Christensen, Ph.D., Author of ‘Keeping Kyrie’ on Blogcritics. Dr. Emily Christensen works as a counselor, helping couples and families to heal emotional wounds, overcome addictions, and live after the manner of happiness. Her private practice began in 2004, with a focus on forensic trauma, Deaf issues, and rural childhood services. She has earned a B.S. in Human Development, an M.S. in Professional Counseling, an M.Div. in Pastoral Counseling, and a Ph.D. in Marriage and Family Therapy, and is doing post-doc work in Hebrew and Jewish Studies. After joining the Church of Jesus Christ of Latter-day Saints in 2009, Emily served a thirty-month mission with the international research team of FamilySearch Worldwide Support, followed by a two-year extension doing special projects for the Family History Department. She began serving as an LDS chaplain in 2014. Emily has been journaling since she was in the second grade and blogging for twelve years. She is deaf, receiving bilateral cochlear implants in 2010, and maintains her love for sign language. She chooses books over television, and organics over processed. She thinks nothing is as close to flying as ballroom dancing. She also enjoys playing outside, running, kayaking, and cycling. She is in love with words and writes every day no matter what. Dr. Christensen is happily married to her husband who writes musical theater, and she and her husband have adopted six children from foster care. Sheri: Welcome, Emily and thank you for joining us today! Why don’t you start by telling our readers a bit about yourself? Emily: I have been writing since I got my first journal in second grade, and have been actively blogging for twelve years. I am Deaf with cochlear implants, and my heart language is still signing. I love to read, but also enjoy ballroom dancing, kayaking, and playing with my children at the river back near our home in Tulsa, Oklahoma. I am very happily married to my husband Nathan, who writes musical theater, song lyrics, and plays. Sheri: What is Keeping Kyrie about? Emily: It’s about love, and how much that can hurt, but also what miracles we experience every day as a family. I tell the story of our journey into foster care and adoption, through the process of my own journey from losing my mother to becoming a mother. The frame of the story hangs on the drama of our youngest daughter, who was born with almost no airway. Sheri: What inspired you to write this book? Emily: There was just so much that happened to us, so much that we endured as a family, it seemed like a story that needed telling. So much happened to us in such a short amount of time, my mind and heart were full of what needed expressing, and writing was a way I could let that out and process it all. We also really had concerns about some of the care the baby received and needed a platform through which we could advocate for change and improve the lives of foster babies who are medically fragile. 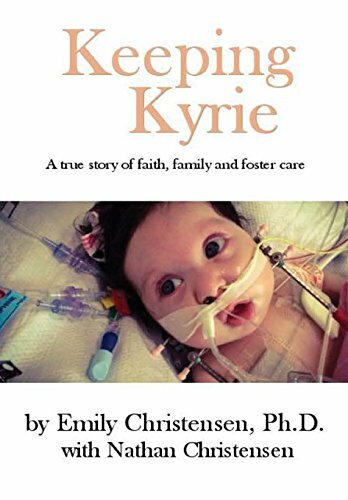 We also hoped that it would be somewhat educational for new foster parents as well as new parents of medically fragile babies with issues like Kyrie. We also wanted to share with social workers and medical professionals what it’s like to foster and the kinds of things we face every day as a family so that they could see and learn from our perspective. Sheri: It must be difficult to foster children and then let them go. How do you handle the attachment/detachment process? Emily: Sometimes it’s easier than others! We write about this in depth in the book, but if when you legitimately sign up for fostering and do it well, then it is very hard to let the children go. What helped us was staying focused on our role as being part of the support system for families, and our testimony that families are part of the plan of happiness. It’s almost too hard to let those little ones go if you are only focused on yourself, but fostering isn’t about you – it’s about the children and their families. We really had to stay focused on that. Sheri: You and your husband have fostered many children and adopted six. What prompted your decision to foster, and how did you decide to adopt the six children that are now a permanent part of your family? Emily: I had been a therapist on several different inpatient units where children were ready to be discharged but had no place to go because foster homes were not available. Clinically there was no reason for them to continue staying in the hospital, but practically there was nowhere for them to go. Nathan had taught children in New York City, and many of them were foster parents. We were just aware of the need and felt we couldn’t really advocate for those children without trying to be part of the solution by helping. Fostering was something we discussed before we were married, and we filled out the paperwork while we were on our honeymoon. The six adoptions happened as fostering unfolded; it was never a part of the plan, and when we signed up to foster we had no idea that we would be unable to have our own biological children. Our story of infertility, miscarriages, and the adoption process for each of the six children – those stories are all in the book. Sheri: It seems that the personal struggles you have endured have only made you stronger. Where do you get your strength and determination to not only carry on but thrive, while enriching all the special little lives around you? Emily: Our faith is obviously a big part of that. When life is too hard or everything is so overwhelming, it helps to know there is purpose in what we are doing and to feel that we are not alone in trying every day to just keep going. Our community, both the town where we lived and our faith community itself, was such a big part of our support system. Their prayers and their participation in our fundraising events, including this book, so that we could get the best care for all the children and provide for ourselves as a family – that made all the difference. It’s one thing to be willing to help these children, and even to do the work to prepare spiritually and mentally, but it was our faith and our community that made actually doing it even possible. Sheri: What can you tell us about Kyrie’s condition? Emily: Kyrie was diagnosed with Pierre Robin Sequence (PRS), meaning she was born with a very small airway, smaller than a coffee straw, as well as a cleft palate and a recessed jaw and almost no tongue tissue. Her condition was complicated due to polysubstance drug exposure in utero. She has had multiple surgeries that have saved her life, but her airway will continue to be a battle as she grows. Sheri: And how is Kyrie doing today? Emily: Today was a good day. Some days are scary. Her presentation is really inconsistent, so we have to watch her closely. She is still on oxygen sometimes, though not all the time like during her first year, and we still are supplementing with a feeding tube through her nose as needed. We still have her on a high-calorie diet because she is so tiny, and we still have to thicken her liquids, but she is fighting hard. Many babies born with PRS do better if they can get through the first year, but we are just now getting to that point at seventeen months, maybe because of the additional battles from the drug exposure. But she is crazy smart, and such a little miracle. She is so happy with such good attachment, which has been a blessing after some of the attachment struggles some of the other children have had. Sheri: What is the public’s awareness level around PRS, and what is being done to help raise awareness? Emily: I think the general public is more aware of cleft palates as a thing that happens more than they are aware of PRS specifically, and I don’t think they know at all how hard it is to care for a medically fragile child who is a foster. There are some good organizations for all of the issues we face in the book: infertility, miscarriage, cancer, fostering, adoption from foster care, parenting deaf children, autism, cerebral palsy, fetal alcohol syndrome, reactive attachment disorder, PRS, cleft palates, chaplaincy, advocacy, grief, secondary medical trauma… there is just so much that we went through in the last five years. We support those organizations that are bringing awareness, and try to share the work they are doing when we talk about those issues on our Keeping Kyrie Facebook page. We also started a nonprofit to help support medical needs of foster children to get them supplies and items that Medicaid doesn’t cover. Now because of the book, we are getting a lot of opportunities to speak about these different issues and help raise awareness. We are also focusing a lot on advocating for patient-informed care rather than just patient-centered care. There’s a difference, and that difference saves lives. For example, Kyrie also has medical cerebral palsy now, with little pink braces on her feet, because of ongoing oxygen issues and not being trached when she was first born or during those early months. That’s intensely frustrating, and part of what has thrown us into advocating for better patient-informed care, because that should not have happened. If someone were diabetic or had a heart problem, they would not deny treatment because the patient had a good day – no other illness is treated for its good days, the way PRS kids get denied access to breathing air because of a good day or a better sleep study when structurally what is happening is so positional and variable that it’s not a good measurement of what is going on from day to day. Sheri: Your family seems to be having quite a bit of fun promoting the book! How did the idea for the video you created come about? Emily: That’s funny! My husband writes musical theater – he wrote Broadcast about the history of the radio, as well as an adaptation of The Giver – and he loves working with actors and composers and all things theater. When he does a project, it is an experience, not just an event. He’s amazing. But one way he shares this with the children is by making these videos - you can see them on our YouTube channel @housewifeclass – where he takes well-known songs the children love and rewrites new lyrics for our family. They love to sing with him, and it’s a way they can bond together and learn about that part of his life. They love dressing up and going to his shows and events, but the videos are a way they can share in his creative process at home. It’s been a delightful way to bond with them and to just play together as a family. Sheri: What has been the most rewarding part about publishing the story of your family? Emily: Sharing our story, and the hard work of writing it, was worth it the moment we got a note from a mother whose baby’s PRS had not been diagnosed and getting proper treatment saved his life. We have also gotten letters and a huge response from the foster community, both foster parents and social workers, about how much it has helped them – as well as some biological parents, who are grateful that we advocate for maintaining those connections when it is safe and possible. We love the people we have met through these shared experiences, and it feels like change the world for the better, even if it is in some tiny way our own little corner. Sheri: What was your biggest challenge in writing “Keeping Kyrie”? Emily: Besides having to stop to change diapers and feed tiny little mouths who are always hungry? Or staying up until after midnight to write while the children are asleep, and then getting up before dawn to write before they wake? Or maybe living it in real life when it was all actually happening?! Really, the time it takes to write, and to write well was the hardest piece. Writing is such an intense process, and the material I was covering was very emotional. I had to really focus on the mental aspects of the structure of the book to get through it. We designed the book to work like a chiasm in Hebrew poetry: the dramatic climax comes in the very middle of the book, and each chapter before and after both parallels and re-emphasizes each other. This created a feminine narrative structure, which I wanted, where every piece of our story circles around over and over again, creating the effect of really experiencing the emotional roller coaster we endured while still keeping it very readable as a book. Emily: Write every day, no matter what. Sheri: What advice can you give to people aspiring to write memoirs? Emily: Writing every day is critical, not just for the discipline but for the practice of capturing intensely live moments. Going back to capture it later will be too difficult, and will taste dusty to the reader. We wrote and edited Keeping Kyrie in only five very-very-very intense weeks, but that was after five years of daily writing as the events were happening in real time. We had material to use and ready for us to select for polishing. If we had waited, doing it from scratch would have used up the time we spent polishing. I am really proud of the book as a piece of literature, but we would not have gotten it so presentable if all the drafts hadn’t already been written as before we sat down to pull the book together as an entity. Instead of having to come up with words, we were able to take our words already written and use them as paint to create this piece of art. It is beautiful, and I am really pleased. Sheri: What do you like to do in your free time, that is – if you have any free time? Emily: I make time for myself; it’s a necessary part of the creative process as much as just being healthy in general. I wake up early before Nathan or the children are awake, and am able to spend that time in study and writing. Before cancer, I loved to read at night, but my body doesn’t let me do that anymore. I work hard during the day to finish tasks so that family time can really be family time and we aren’t distracted from that. For now, our children are still young enough that they go to bed early and Nathan and I have our evenings together which helps a lot, but after having fostered teenagers, we know that won’t always be so easy. While we work hard, and long hours, and do a lot of speaking as well, we really fight to protect our personal time for ourselves and our family. It’s really a big priority for us. Sheri: Do you have a website or blog (or both) where readers can learn more about you and your family and your book “Keeping Kyrie”? Emily: I write a blog at HousewifeClass.com and our store lists the book at HousewifeClassStore.com – it’s available in hardback at the major online stores for books – it will come out in paperback in those stores next year, but you can get it in paperback at our store already. Emily: If you buy the book, you should also buy Kleenexes! We are just really grateful for the outpouring of support from so many, thank you. Sheri: Emily, thank you so much for being with us today. It has certainly been a pleasure getting to know you and your family!